In the third of his Heart and Soul series for the BBC World Service, featuring people who have faced some of the hardest life choices imaginable, Mike Wooldridge meets a man who rose high in his chosen career – and lost it all because of his faith. Iftikhar Khan was a highly successful lawyer in Quetta in Pakistan, with a lifestyle to match. He acted as legal advisor to several banks as well as the United Nations. He was also a member of the Ahmadi community: a minority group which defines itself as Muslim, but is not accepted as such by many in mainstream Islam. In Pakistan, Ahmadis are prohibited by law from claiming that they are Muslims. Many have suffered threats, physical violence and worse. For Iftikhar, all went relatively well until in 2010, he was abducted by armed men on his way to work. They held him blindfolded and in chains for 20 days, and left him in no doubt about why they had taken him: because of his Ahmadi faith. Eventually released for a ransom, but under threat of further violence, Iftikhar and his family made a tough choice: they left behind everything they had worked to build in Pakistan, and fled to Britain. Initially, life as refugees meant having just one room to live in and not being allowed to work. Although he admits things have not been easy, Iftikhar’s overriding feeling is gratitude: to the country that gave him shelter, and to the God who, he feels, never abandoned him during his ordeal or since. 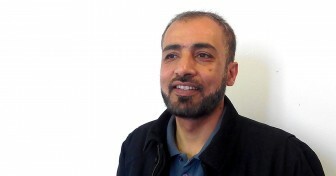 You can listen to Iftikhar’s story via the Heart and Soul website.